You know that old saying about home decor: love that couch, but where’s the murder mask? So here you go, a stunning handmade snuff film accessory from Barbara and Richard Keal. “What started as an interest quickly became a passion for husband-wife duo Barbara and Richard Keal,” reads the item description. Yes: murdering people is often like that! 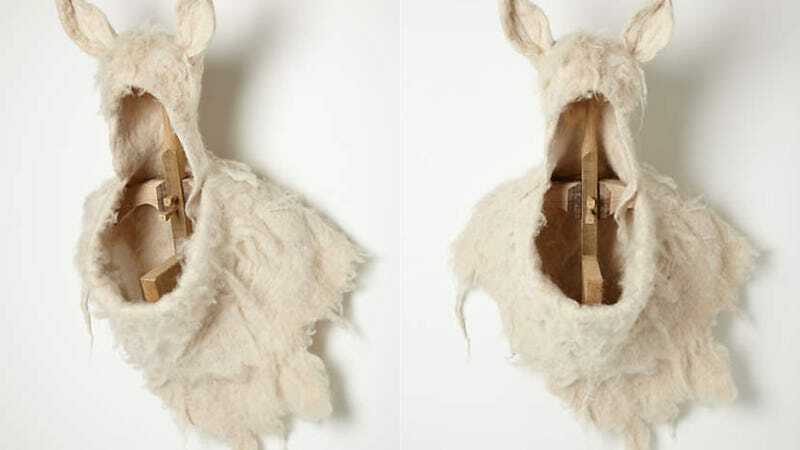 Previously priced at $3200, the alpaca nightmare fodder is now an ultra-affordable $1600. Furthermore, the company’s now offering 30 percent off all sale items. So you could really get all of this for $1120, although this double bargain will be offset slightly by the $300 shipping fee that Anthro requires in order to send you an artisanal sheep head by mail. The wood that holds up the shape of the dead alpaca is “fashioned” by hand and “sourced from tree surgeons” in Sussex. I’ve never seen anything more worth it in my life.